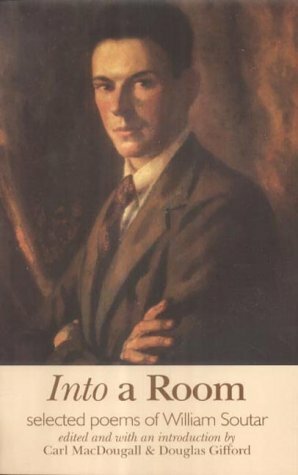 Into a Room :Selected Poems of William Soutar (Argyll Publishing, £7.99) is a significant new addition to the Soutar bibliography. In their introduction, editors Carl MacDougall & Douglas Gifford set out a highly intelligent and insightful analysis of Soutar’s poetry and psychology. Soutar’s long illness and isolation, generally considered to have limited the full development of his talents, are here revealed as the very crucible of both his artistic and his spiritual growth. The poet emerges as not so much a foot-soldier in MacDiarmid’s Scottish Renaissance, more the author of a kind of Scots poetic existentialism. He was well aware that, as far as the psyche is concerned, he was no more isolated than any of us, while his physical limitation gave a poignant truth to the notion of the self as author of the life. Soutar’s particular gift was his ability to combine a minute attention to detail and an appreciation of the everyday, with a vision of the universal – the what-is with the mythic. In the same way he was able to make a bridge between tradition and modernity, and used both Scots and English as vehicles for the development of his creative identity. It is fitting that the editors abandon the common categorisations of Soutar’s poems, both in terms of content and language. The book should mark a leap forward in our appreciation of the full worth of Soutar’s writing. In her Indian Selection (Akros, £2.75), Tessa Ransford celebrates the generosity and abundance of India. It should be said that she writes not from the perspective of a visitor or onlooker, but with the voice of someone entirely at home in India and in her own Indian-ness. The poems map out the interweaving relationship between Scotland and the sub-continent in Ransford’s life. An Indian spirituality is alluded to in simple but effective imagery – ‘conflict caught in secret harmonies/movement in rock,solidiy in sky’, as are its contradictions – ‘a smile latent in sorrow/and a love in anger’. Poverty, dust and indifference are all accepted without judgement as part of the whole. In ‘Faded Indian Bedspread’ one senses a metaphorical introspection, which becomes more explicit in ‘My Indian Self’. But Ransford is as generously accepting of herself as she is of India:’My body is myself/however ageing./I love the way it has borne/with me all these years.’ One senses that there could yet be more poetry in India for Ransford. Of Rowan and Pearl (Argyll publishing, £6.99) brings together Margaret Gillies Brown and Kenneth C. Steven in a substantial collection of poetry of rural Scotland. Both writers share a sensitivity to the particular conjunctions of time and place, and if one theme can be traced through all of the book it is the expansiveness of the Scottish landscape. Brown’s poetry is the more varied in range and style – she allows herself more space and looseness. Her landscapes seem to be softer and have more people in them. Steven’s writing is more spare and taut, the poems shorter – like he’s holding himself in. But that’s only so that he can let loose a sharper undercurrent of meaning.